Tobins' Tastes: Saved 102% at Publix- Thanks To Trial Sized White Strips On Clearance! Saved 102% at Publix- Thanks To Trial Sized White Strips On Clearance! I am obsessed with checking clearance sections anywhere I shop. Justin is always making fun of me for it. But as annoying as it may be, I usually score some pretty great deals on things on clearance at both Publix and Target. One of my favorite things about clearance items is that many times you can use coupons to make them even cheaper than their already slashed prices. 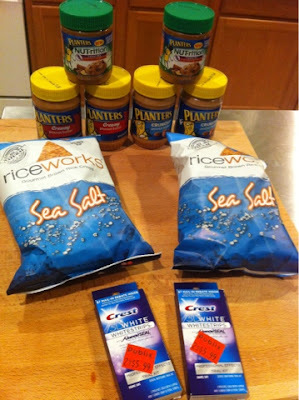 You may remember a shopping trip I had last year where I was able to find ten trial sized Crest White Strips packages marked down to $2.99 each and was able to use my $10 off (no size restriction) coupons to earn serious overage and buy ten pounds of meat and lots of other groceries for less than $2 total. Those packages came with $7 off (no size restriction) coupons which I always keep handy in case I run across this deal again. Except for on Monday. On Monday I was doing my usual perusal of the clearance section and I stumbled upon a few of my favorite clearance items. I had just cleaned out my coupon folder and had accidentally left those coupons on the kitchen table. So I resisted my crazy couponer urge to return to the store minutes after I got home from my shopping trip and decided to go on my way home from work the next day. As fate would have it, when I returned yesterday the whole clearance section had redone and there were only two boxes left. I used two of my $7 off coupons to get $4 of overage per box and I also used a $5/$30 Winn Dixie coupon which means that after all my coupons, Publix actually owed me .63 cents. Not too bad considering I was able to grab six jars of peanut butter and some of our favorite rice chips too. I usually use overage to get meat and produce but since we aren't really buying meat while we clean out the freezers and we had plenty of produce in the fridge I just grabbed something we always use and has a long shelf life. Make sure you come back tomorrow for my normal Thursday Publix trip and weekly totals link up!